ACDelco GM Original Equipment Tire Pressure Monitoring Sensors (TPMS) are battery powered sensors located in the tire that monitor the vehicle’s tire pressure, and warn the driver when pressure falls more than 25% below the manufacturer’s recommendations (normally through a slow pressure loss). The sensor is connected with the valve stem, and by way of Radio Frequency (RF) technology, sends pressure updates to the vehicle’s on-board computer. Tire pressure is displayed on the vehicle’s Driver Information Center (DIC), or when low, a warning lamp might be illuminated to warn the driver. The U.S. Federal Regulations require that new cars and light trucks be equipped with TPMS starting in 2008. 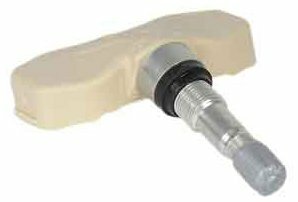 These original equipment tire pressure monitoring sensors have been manufactured to fit your GM vehicle, providing the same performance, durability, and service life you expect from General Motors.